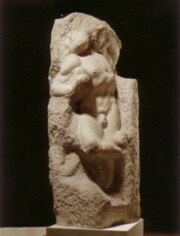 The Visit of this marvellous city, which houses series of unique art treasures, is obligatory for any lover of art. Despite its cultural and historical significance, Florence is one of the most pleasant cities in Italy. It still remembers the small medieval centre, which has contributed so much to the cultural and political development of Europe. Also today Florence’s urban heart proposes between Piazza della Signoria and Piazza del Duomo. Together with our English-speaking expert guide you will visit the Galleria dell’Accademia (Accademia Gallery). In the 1 ¼ hour tour you will discover one of the most famous museums in the world, which houses the world known David by Michelangelo Buonarroti as same as many other masterpieces. After the visit you will go to reach the Piazza del Duomo (Cathedral Square), where is located one of the most fascinating Cathedrals of the World: S. Maria del Fiore. It was built during the years 1296 – 1461, while the gothic façade was completed only in the 19th century. 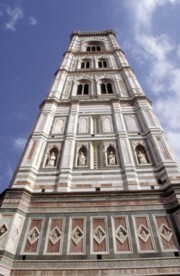 In 1334, Giotto, who also planned the Bell Tower, took over the management of the construction. The work of the dome was finished by Filippo Brunelleschi about one hundred years later. 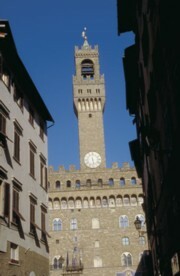 Nearby is the Piazza della Signoria, which is the political symbol of Florence since more than 600 years. There are the Palazzo Vecchio (built in 1299) and Ammannati’s Fountain of Neptune, which is mocked by many as the Big Whitey because of its white marble giant. 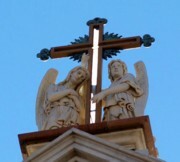 The tour finishes with the Visit of the largest Franciscan church in the world, the Basilica of the Holy Cross. 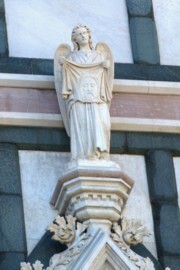 The Gothic church contains the tombs of Michelangelo, Galileo and Machiavelli.